We also love getting emails and testimonials or reviews on our Google Business page, Yelp Business page and Facebook page from the people that have tried our mini cupcakes! Below are some of the kind words people have said so far! Thank you for your creative cupcakes that were apart of our “Dreamnight at the Zoo” for the Stollery Children’s Hospital. The kids loved all of the animals that you created. Thank you for bringing smiles to so many faces. Carol you are AMAZING. I love showing off your talents by hosting our events exclusively with mini bites. You have truly found your passion and you’re pulling it off incredibly. Thank you so much for being apart of what we love to do- couldn’t imagine our photo shoots without you! Thank you for sharing your delicious cupcakes with us. Your help, helped to make our banquet a success. A huge thanks to Carol for her constant ability to keep up with last minute orders, special requests and provide all-around fantastic cupcakes every time! Looking forward to the next batch of those custom made MiniBites cupcakes. Oh Renee, I just talked to Chelsey and she was absolutely thrilled!! Not only did she simply love the packaging and the card but she said even after trying so many cupcakes at other locations in Saskatoon, these were hands down the very best! Moist, delicious, fresh, and beautifully unique, every single one. I cannot thank you enough, they completely made her birthday. And you were such a pleasure to work with. Thank you, thank you! Absolutely amazing cupcakes Carol! Your Christmas eggnog cupcakes were out of this world. Can you come back every week? The cupcakes were a hit at my son’s birthday. They matched our lego theme perfectly. They were delicious! Everyone raved about them. Thank you so much! Thank you for helping us out with cupcakes for our “Baked with Love” event for Ronald McDonald House. They were delicious. Thank you for sharing your little bites of love with all of us at Yoga Within. The days that we have cupcakes after class makes doing the class so much easier. We have some people that claim their cupcake before class and place it at the top of their mat. It really is all about the focus. We love your cupcakes. We hired mini cupcakes for a charity hole at a recent golf tournament. They were such a big hit! Lots of fun, fresh and beautiful. I would highly recommend Mini Bites for any event. We were so delighted to have cake pops provided by Minibites for our May donor appreciation event in Edmonton. Most of the attendees had never heard of cake pops before and they were very impressed by not only the incredible taste, but the special packaging Carol crafted to match our brand too. We had numerous requests from attendees for additional cake pops to take home to their families at the end of the evening…guess we should have ordered more! Thank you so much Carol for brightening the day of our valued donors, many of whom are currently facing cancer or are recent cancer survivors. You were so easy to work with and even delivered the sweet treats to the event location so we could focus more on set up and giving special attention to our donors. Your efforts are much appreciated and we can’t wait to work with you again! Thank you for the lovely cupcakes and beautiful cake you made for our 25th anniversary. We really appreciated them… and they were enjoyed by all. Your cupcakes were a delicious addition to our “Brunch of Love” to celebrate Valentine’s Day. Thank you again for sharing with us. Thank you so much for the above and beyond work you put in for our July 7, 2012 wedding cupcakes in Edmonton. They were exactly what I hoped for and at an excellent price. People are still raving about them a month later! I have to admit that I had four or so myself. I also appreciate your lending up a cake stand and setting it up for us – that was an amazing added bonus, and I can’t believe you did it for that price! Minibites sponsored WordCamp Edmonton 2011, a web design & development conference that I was a part of organizing. Not only were the cupcakes met with rave reviews by all attendees, but Minibites were nothing but prompt, professional and friendly. Highly recommended. The cupcakes were just great! They matched the theme of the party, were a great size, and the guests loved them. Carol was a pleasure to work with! Thank you. 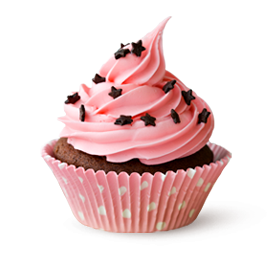 Send us your cupcake testimonial! We’re always wondering what people have to say about our mini cupcakes and would be honoured to hear your thoughts. Please take 2 minutes to help us improve our service by fillin out the form below and sharing your thoughts and feedback. What did you think of our mini cupcakes?